A shipwreck is the remains of a ship that has been wrecked. Shipwrecks are found either beached on land or sunken to the seabed of a body of water. They may be deliberate or accidental. UNESCO estimates that worldwide over 3 million shipwrecks. Some are thousands of years old. Historic wrecks are attractive to marine archaeologists because they preserve historical information. For example, studying the wreck of Mary Rose revealed information about seafaring, warfare, and life in the 16th century. Military wrecks, caused by a battle at sea, are studied to find details about the historic events. They can reveal much about the battle that occurred. Once in a while there is a discovery of a treasure ship, often from the period of European colonisation. Some contemporary wrecks, such as the oil tankers Prestige or Erika, are of interest because of their potential harm to the environment. Other contemporary wrecks are scuttled (sank deliberately) in order to create reef growth. 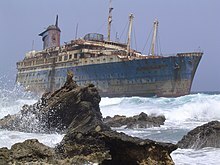 Some very famous shipwrecks include the RMS Titanic, HMHS Britannic, RMS Lusitania, SS Andrea Doria, SS Edmund Fitzgerald or the Costa Concordia. There are also thousands of wrecks that were not lost at sea but have been abandoned or sunk. These abandoned, or derelict ships are typically smaller craft, such as fishing vessels. They sometimes pose a hazard to navigation. ↑ UNESCO. "Wrecks". Underwater Cultural Heritage. Retrieved November 22, 2014. ↑ Arango, Tim (September 11, 2007). "Curse of the $500 Million Sunken Treasure". Fortune. Retrieved November 22, 2014. Wikimedia Commons has media related to Shipwreck. This page was last changed on 4 May 2018, at 10:36.